We start with Professor Pyg. I like Pyg. He’s an interesting villain with a creepy MO and Orlando uses him pretty well here. 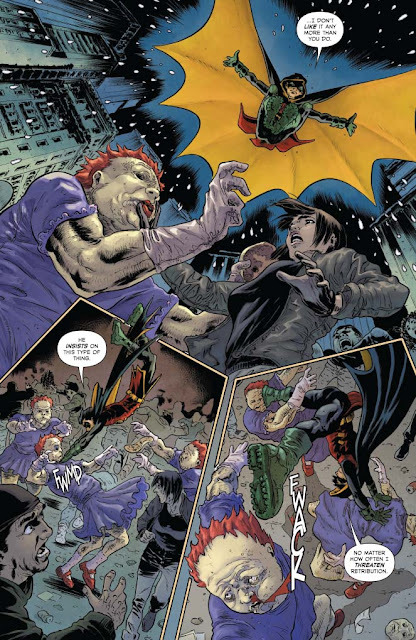 Unusually, Pyg is in New York, which means, even more unusually, so is Batman who appears with Damian to foil his plans. The fight is visually impressive, although the dialogue is decidedly off in parts – particularly with Damian. (“No matter how often I threaten retribution”? Er… no.) 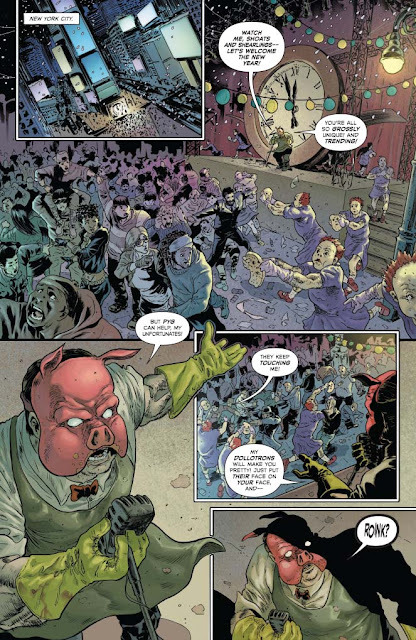 There’s some somewhat confusing dialogue about Pyg trying to restore his “toys” that someone else has “made… perfect puppets” and a mention of the ‘Silent Seven’, which Batman decides to follow up as a matter of urgency, despite the abundance of forensic evidence laying around the place in the form of Pyg’s dollotrons. Oh, well. Pyg’s dialogue is difficult to interpret at times. I know he’s an obsessive, unhinged character, but that’s all the more reason to be careful about throwing out enigmatic speech bubbles like confetti at a wedding. Still, the main gist appears to be that someone’s been interfering with Pyg’s ‘work’ and Pyg only wanted to restore things back to the way they should be. We then shift to a rather effective, mournful page of Margo Lane’s funeral with The Shadow showing up at the end when the other mourners have departed. All very moody and atmospheric. Then, we’re back to a scene between Pyg and The Shadow where The Shadow seems to stop time in order to have a private chat with Pyg in his holding cell. Visually, this is tremendously impressive. The sense of The Shadow getting progressively closer to his quarry; the way Timpano and Dispenza use the shadows from which their namesake emerges; the implied pressure of The Shadow’s fingers on Pyg’s mask (which, it should be said, perfectly complements Orlando’s “you’re already squeezing it out my ears”): all work very effectively indeed. It’s a shame then that Orlando’s dialogue is often too elliptical to be useful. Pyg allows The Shadow to read his mind and the message there that Pyg’s found inside the Dollotrons. There’s no hint for the reader, however, as to what the message might actually be or what form it might take. All we know is that, whatever it is, it’s freaked The Shadow out. Not that that stops him from moonlighting as Alfred in the next scene. Or is he? Oh, you writers and your… ambiguity. This whole concept of The Shadow assuming the identities of Batman’s friends and acquaintances in order to guide and shape his development was first introduced in the previous series and reinforced during that series’ final scene. As a concept, it has a certain attraction, I suppose, but the devil, as always, is in the details. Having the page end with Alfred’s speech bubbles turning all Shadow-esque and rectangular is all fine and dandy, but it raises questions that the creative team appears to have no interest in answering. Like, how does this actually work? Is The Shadow impersonating Alfred? (In which case where’s the real one at this moment? If Batman refers to conversations that he thinks he’s had with Alfred but of which Alfred has no knowledge, won’t the world’s greatest detective realize something’s up?) Is he possessing Alfred? Or stopping time to step in as Alfred for just a few moments? I don’t know. And that’s the problem. I’d quite like to know why The Shadow would choose this particular moment to talk to Bruce – and about Damian, no less – but Steve Orlando doesn’t want to tell me. Or even consider the question. There’s a lovely double page spread of the Batcave to follow, but Batman’s investigation consists primarily of looking at old newspaper front pages, talking to himself and making surprisingly sure conclusions. The link between ‘The Silent Seven’ and Pyg is explored here but Orlando’s dialogue doesn’t make that exploration particularly easy to follow. There’s something faintly absurd about Batman berating himself for not having heard of James Moriarty the “Napoleon of Crime” (and Sherlock Holmes’ arch-nemesis), considering he’s been dead for well over 80 years at this point. The implication is that Batman is uncovering a vast criminal conspiracy that, until recently, has been dormant. Why it should suddenly reveal itself now is, like much of the background to this story, unclear. 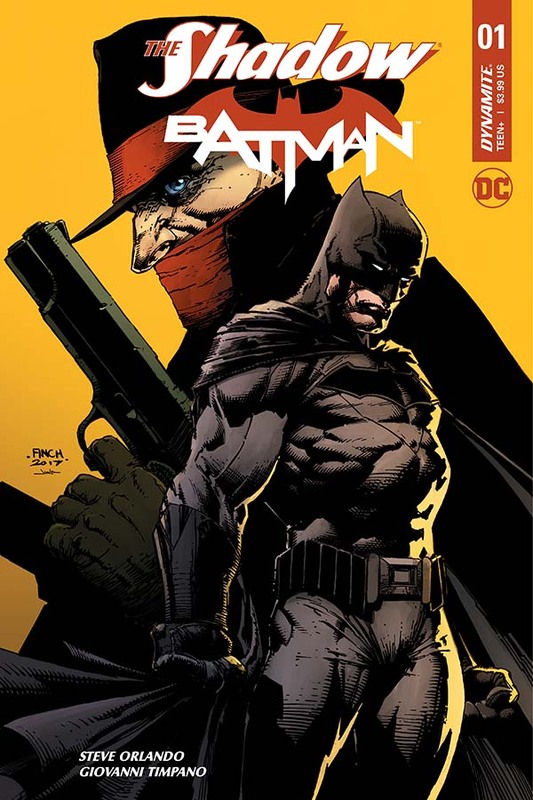 That lack of clarity is not helped by the issue’s final scene – a confrontation between an oddly-written Damian and a ‘Batman’ whose true nature is none too subtly hinted at by some portentous white on black word balloons. In some respects, this verbal – and then physical – spat is representative of the problems with this issue as a whole. 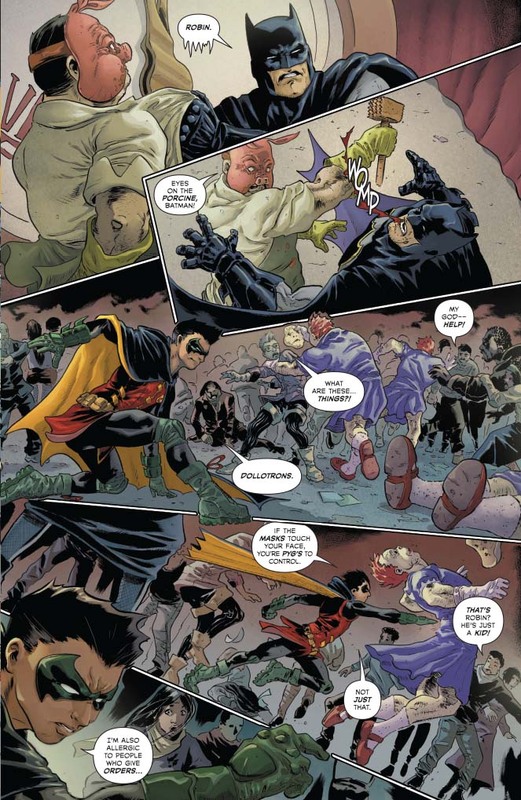 Damian’s cleverness, verbal wit and general attitude are on display, but the details of Damian’s language and speech patterns are decidedly off. In fact, everything is ‘off’ in this scene, although, admittedly, our ‘Batman’ is meant to feel wrong. The issue ends with a bold, dramatic flourish that has considerably less impact than its writer probably intended. Or perhaps, like the reader, he’s just happy to have reached the end of the issue. There are some intriguing moments here. Batman’s investigation into the Silent Seven throws up old newspaper stories that feature other Dynamite properties like Miss Fury and The Black Terror. The implication that all you need to do to cross over into a different reality is move from one city to the next (something that any Manchester United fan working in Liverpool experiences on a regular basis) is a neat and understated way of dealing with the meeting of the two franchises. The Shadow’s brief time on the page is possibly the highlight of the issue, Orlando’s Pyg dialogue excesses aside. That final confrontation between Damian and ‘Batman’ – overlong, over-scripted and overwrought – is an odd way to end the issue, though. Consequently, it’s difficult to give this opening installment an unreserved recommendation. Moments of class and excitement occasionally dazzle in this opening issue, but the story is too muddled and the dialogue at times too awkward to make it as entertaining as it could – or should – be. Timpano’s art is, on the whole, good. At times it is excellent; at others, merely adequate. There are, to be fair, enough mysteries here to keep this reader interested, but the opaqueness of the writing makes them too often a chore to encounter. Let’s hope for better things next issue. I'm liking this one better than the previous mini (so far), but it REALLY feels like we're sort of being dropped into the middle of a story. . .like this should actually be the third issue. Maybe it's just me, but it feels a bit strange.